Perhaps it is with the onset of the Holidays that we begin to ponder about “baking”. Or perhaps it is the cooler weather that leaves us yearning for a sweet indulgence, paired with a sensational cup of coffee. Alas, the baked sweet. Certainly, the Winter months, particularly December (let’s not forget February’s love-fest) is one of the sweetest months of the year. However, every day of the year and each and every month one can find oneself inspired to bake. Inspired, I am. I met “BAKED”. (In fact, my story be told…about a year or so ago, I had stumbled upon an amazing cookbook. Immediately, I was smitten by the presentation of the book and edgy inner pages of brilliant orange dotted with a drawings in chocolate brown of a stag deer head. It was Baked. 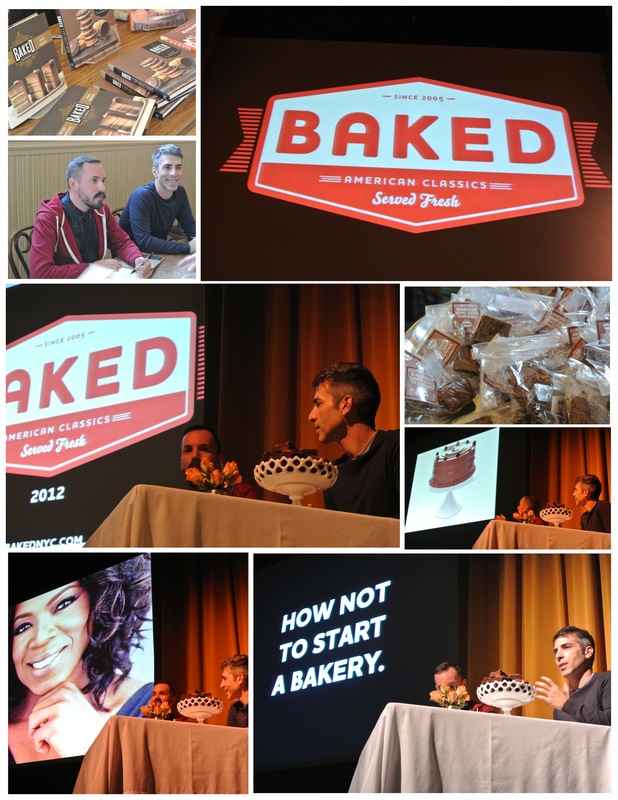 Sharing my excitement and intrigue, it was a matter of time that the famous duo of bakers, Matt Lewis and Renato Poliafito from the bakery “BAKED” in Red Hook, Brooklyn were in our midst in Northwestern Illinois. How thrilled, was I! Add to that, being from Long Island and obsessed with all things New York/East Coast…I was blissfully thrilled! Success always has a story behind it. The road is always interesting. It is the journey that makes our journey and reaching our destination that much more interesting. Sometimes bitter and sometimes sweet. “Sweet and Salty”, perhaps. The journey of these “Gentleman Bakers” is one that is certainly continuing as they embark on new avenues and paths with “BAKED”. A “BAKED” success story, indeed. Since the bakery opened its glossy orange door in 2005, Matt Lewis and Renato Poliafito have since been featured on Oprah, the Today Show, the Food Network, and Martha Stewart. In fact, their first book, Baked, was an IACP (International Association of Culinary Professionals) award nominee. Recently, to the delight of us all, they’ve teamed up with Williams Sonoma to sell their “infamous baked brownies, brookies, sour cream coffee cakes, and red velvet whoopie pies- all in ready, simple, luxurious ready to make mixes.” Accessible to those of us in the United States, for certain. Alas, if you cannot get to Brooklyn, consider their website to bring “BAKED” to your home. A sweet addition to your cookbook collection, your kitchen and a straight shot to your heart and tastbuds, indeed…. Matt and Renato refer to themselves as “Dessert Archeologists”, “digging and researching and eating their way through the regional desserts of America”. Sharing again from their website (I love this part): “They spend a disproportionate amount of their vacation time in bakeries, chocolate shops, coffee houses and used book stores and they spend almost all their discretionary income on cake and coffee and cookies and wine”. That is fantastic. I will certainly attest to their baking skills. A baker at heart, I always appreciate the art of well written cookbooks with inspiring images of delectable creations. The end result is always key, and the results I have had with the decadent deserts I have embarked upon from the pages of Baked’s cookbooks have left me with further inspiration to create the luxurious decadence of “BAKED”, elements of delight. Delicious sweets paired with a love of coffee. Perfection, indeed. Oh, to see the daily creations stocked in their Brooklyn bakery! In fact, the bakery is certainly on my must-visit-points-of-travel list. Of course! An admitted groupie am I. Not only am I eager to step inside that iconic orange door, but to see, again,the delightful and inspiring bakers! It will be a sweet moment, indeed. Until then, I can occupy my mind on sweet weekly inclusions of interest on their wonderful blog, “The Baking Society”. It is certainly a “sweet read”. Cheers to baking- with “BAKED”!